A new favorite for kids and adults! Every player gets 10 dice. 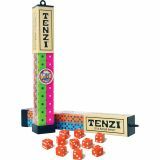 The object is to roll the dice as fast as possible, the player who gets all dice on the same number and yells "Tenzi!" is the winner. Alternate rules included to add variety and new challenges.